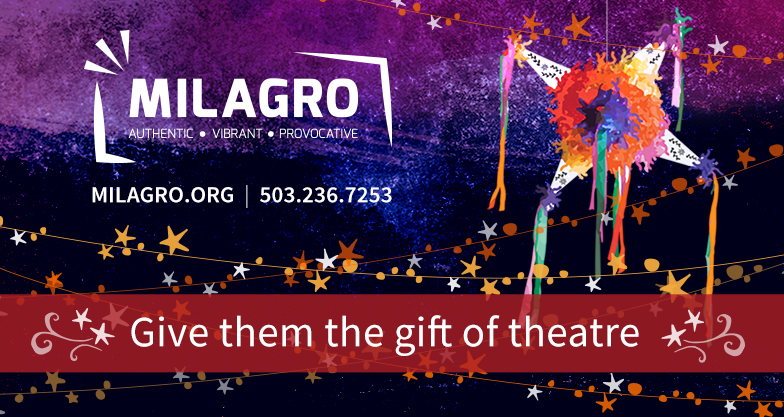 Celebrate the Holidays with Season Tickets to Milagro! Home » Blog » Celebrate the Holidays with Season Tickets to Milagro! With the holidays right around the corner, Milagro is ringing in the season with some festive, special promotional offers. From now until January 1st, Milagro is offering a special price on all Holiday Flex Passes. Purchase a seasonal subscription, and get 3, 4 or 5 tickets for $20 each! That’s right – if you purchase a Holiday Flex Pass before New Years Eve, save 35% on every ticket. With a Milagro Flex Pass, you can use your pass for different shows or all for one show, the choice is up to you! Select the shows and dates at the time of purchase to guarantee the seats that you prefer, and if your schedule should change, you can easily exchange your tickets for another date with a simple phone call. Breeze past the line at the box office with your tickets already in hand to your favorite seats – give the gift membership at Milagro. Additionally, Milagro is offering Holiday Gift Certificates at a discounted price! Purchase a gift certificate for $50, and share 2 complimentary admissions for any production of the 2018–2019 season. Call the box office at (503) 236-7253 during business hours to purchase a gift certificate over the phone, or order online. We’ll mail a physical copy of the gift certificate to your recipient of choice, or simply bring in your square receipt when you come to a show and we’ll redeem it at the box office. Here at Milagro, we believe experiences make the best gifts of all. Don’t miss a moment of our 35th Anniversary Season. Give them the gift of theatre, and make lasting memories with those you love. Purchase your Holiday Subscription TODAY!